Living in one of the most challenging areas in the country does not deter villagers from doing their daily activities, even if it means defying death. Nevertheless, government intervention is needed to further improve their welfare. The remote Porelea village, in the Pipikoro district of Sigi regency, Central Sulawesi, is home to some of the toughest and most resilient people on Earth. Visitors need to take a three-hour car ride from the provincial capital of Palu to the south to reach the Gimpu region. From Gimpu, the only way to reach Polerea is by hiring an ojek (motorcycle taxi). The village is located some 600 meters above sea level in the Kyou Mountains and the only access road is a narrow, rocky path. The access road is an extreme and deadly route. It has a width of only some 80 centimeters, wide enough for two motorcycles to pass, but it is extremely narrow considering the fact that the road hangs on the edge of steep cliffs. The road is also pock-marked with large rocks, holes and mud, and it can get very slippery after rain. At any moment during the trip, if the driver loses his concentration and slips to the cliffs, then death will surely await. If the fall does not kill you, then the large rocks alongside the cliffs will. After one-and-a-half hours of riding, visitors will arrive at the first checkpoint of the journey to Porelea. Here lies a fragile suspension bridge made out of wood that hangs about 20 meters above the rocky and rushing Koro River. Usually, at the other end of the bridge, there is a scout from Porelea that will ride his motorcycle as fast as possible back to the village to tell the community living there of coming visitors. After the bridge, the road will get even narrower and even more dangerous as the cliffs get steeper and steeper while at the same time, ojek drivers must face hundreds of sharp turns that could potentially slip them and their passengers down to their deaths. “You must have your motorcycles heavily modified to go through this road,” Andi, an ojek driver who has been taking visitors to Porelea for the last 10 years, said. A one-way trip to Porelea costs Rp 200,000 (US$13.77). It is a fee that is far too cheap considering the dangers that the drivers must face to get to the village. After a two-hour death-defying trip from Gimpu, visitors can finally arrive at Porelea. 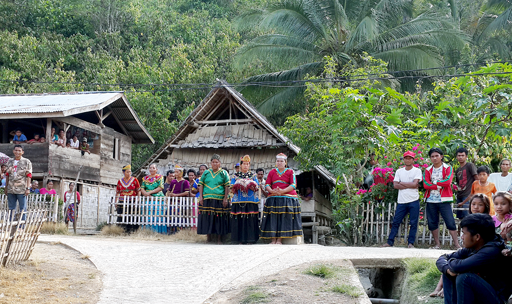 Here, the locals will greet the visitors with a traditional dance called Rego. This is a dance for many occasions. It can be a welcoming dance, a farewell dance or a ceremonial dance for the dead. It is uttered in an ancient language that the locals themselves do not have the courage to translate because they consider it sacred. The economy system in the remote village relies heavily on agriculture. All of the locals work as farmers and one of their main commodities is coffee. They used to sell their coffee in the form of raw beans but a couple of years ago, after receiving some training in entrepreneurialism from a Sulawesi-based non-government organization called the Karsa Institute, they have managed to develop the capacity to produce ground coffee. “What used to happen here for a very long time is that they sold their coffee beans very cheaply to the people living at the foot of the mountains. Then they purchased ground coffee for a much more expensive price for their daily consumption,” Budi, a facilitator from the Karsa Institute, told The Jakarta Post. Budi added that heavy coffee consumption had been a tradition in Porelea since the early 1900s when Dutch colonists arrived in the village and introduced coffee beans to the villagers. Around 100 households in Porelea used to spend Rp 12 million per month purchasing ground coffee, which was made from coffee beans produced in Grimpu village. “But now, they can produce their own ground coffee for their own consumption. If they have leftovers, then they will go down to sell it to coffee shop owners in Gimpu,” he added. The locals sell their coffees to local cafe owners in Gimpu for around Rp 50,000 per kilogram. Considering the fact that they need to go through the same dangerous road to get to Gimpu, it is fair to say that this price tag does not give them any kind of decent profit. Coffee does not have any significant effect on the locals’ livelihood in Porelea due to low productivity. The locals still produce ground coffee in a very traditional way using manual grinding. At the most, a household in Porelea could only produce between one and 5 kilograms of coffee to be sold per month. Other than coffee, Porelea residents have also been planting and selling cacao since the 1970s. The price tag for this commodity is only at between Rp 18,000 and Rp 20,000 per kilogram and like coffee, cacao is not also produced in a quantity large enough to boost the local economy. “Cacao is still sold in its raw form because the locals have not yet developed the capacity to make it into chocolate,” Budi said. With the low value of Porelea’s main commodities, the residents rely heavily on rice production for their logistics. “They do not sell their rice. The whole rice production is being used by themselves for consumption,” Anto, another activist from Karsa, said. A senior tribal leader in Porelea, Abed Nego, said the village and its residents were desperately waiting for both the regional administration and central government to start paying attention to the urgent need for proper infrastructure in the Pipikoro region. “Most of the road that connects us with Gimpu was solely built by our own people without any help from the government,” Abed said.